Today, Warner Bros dropped the first trailer for the sequel to 300 called 300: Rise of an Empire. Because this is so new, we won’t waste a lot of time on analysis and just say this looks pretty cool to us. Plus, Eva Green. Just sayin’. It also has that guy from the Cinemax show Strike Back, which we like and think is one of the best action shows on TV. Other than that, hope you enjoy it too. Look for the movie in theaters in March, 2014. It has been confirmed that Rodrigo Santoro will reprise his role as Xerxes in 300: Battle of Artemisia. Santoro will join Eva Green (Casino Royale) as Artemisia, Sullivan Stapleton (Darkness Falls) as Themistocles, and Jamie Blackley (Snow White and The Huntsman) as Calisto. The story is rumored to be a sort-of-sequel which will follow Xerxes (Santoro) is pushed into the bloody battle with the Greeks by the gold-covered maven goddess Artemisia (Green). Artemisia utilizes her knowledge of how much Xerxes’ father King Darius’s death has affected him, persuades Xerxes to go into battle against those responsible. 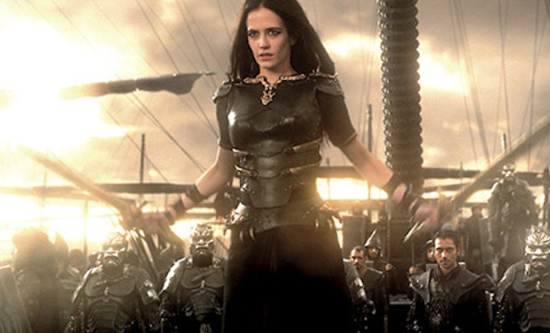 Artemisia also searches for group of men to join Xerxes in the battle against the Greeks. She manages to use her feminine wiles to convince Themistocles (Sullivan Stapleton) to side with her and Xerxes, even though the Persians took her family and he was firmly on the side of the Greeks. Ultimately, she convinces him that his life will be better off if he swaps sides. Themistocles’ skills as a fighter are only rivaled by his ability for deception and lies. I don’t have much experience reviewing children’s movies, so, before writing this, I did some research to glean a few of the points prescient to their reviews. Fortunately the standard kid-flick critique doesn’t differ much from your standard, well, non-kid-flick review. The only theme uniting them all is to note whether adults will enjoy it as much as their brood (or whether either audience will enjoy it). So let’s get that out of the way: The kids will probably enjoy it (the ones invited to my screening didn’t make too much noise, but that may have been due to the iron fists of their handlers); adults won’t mind it. Rio isn’t particularly sophisticated and comes with your basic (and I use this term only because it does very much apply here) cookie-cutter plot in which you already know everything that’s going to happen within the first 12 minutes, and, beyond that, there’s not a whole lot else—save for the location shots, which I’ll get to in a moment. The story is that Blu (Jesse Eisenberg) is a rare Spix macaw, taken from his homeland of Brazil when he was a chick and shipped to Moose Lake, Minnesota, where his crate falls off the back of the truck and he’s adopted by Linda (Leslie Mann), a bookish girl who raises him over the next 15 years. Linda doesn’t make many friends in that time, but she does open a bookstore, and the story proper begins when Tulio (Brazilian actor Rodrigo Santoro), a bird scientist, drops by to inform Linda that Blu is one of the last of his species and must go to Brazil to mate with Jewel (Anne Hathaway), the other last of the species. Fast, fun and stylish comedies are in short supply this year, so I was really looking forward to I Love You, Phillip Morris. But for all its wackiness, witty editing, colorful production design and terrific performances, by the end it was a movie I had suffered through more than enjoyed. That sounds worse than it is. I liked ILYPM a lot. I just wished I’d loved it. Which is not to say the movie is a failure. I think it may have beeen the intention of co-directors John Requa and Glenn Ficarra to tell a dark story all along. And the increasingly troubling gap between the protagonist’s inner reality and the flashy filmmaking may be a brilliant device to unease us. If so, it worked. The true story of a devoted husband, father and deputy cop, I Love You, Phillip Morris begins just before the moment of this upright citizen’s transformation to outrageous gay conman. The outrageousness is not the gayness, but the audacity of the frauds he perpetuates. Even more outrageous are his legendary escapes from jail—four times in five years, all on a Friday the Thirteenth (because his boyfriend, Phillip Morris, whom he meets in prison, was born on a Friday the Thirteenth). Jim Carrey gives a balls-to-the-walls performance as Steven Jay Russell, the church organist-turned-gay-felon, attacking the character with his usual terrier-like zeal, but also with a deep infusion of darkness. Carrey has always been able to tap into a certain twisted place, and in the past it has divided critics and box offices, most notoriously in The Cable Guy, which, coming on the heels of the wildly popular Ace Ventura, left audiences reeling.